With India’s stand-in captain Rohit Sharma picking Krunal Pandya ahead of Kuldeep Yadav for the game at Eden Park, a section of the fans was irate for they felt it was ‘Mumbai Indians quota’ which was affecting team selection. Club cricket had an ugly shadow over country ahead of the second T20I between New Zealand and India in Auckland on Friday. With India’s stand-in captain Rohit Sharma picking Krunal Pandya ahead of Kuldeep Yadav for the game at Eden Park, a section of the fans was irate for they felt it was ‘Mumbai Indians quota’ which was affecting team selection. Krunal, elder brother of all-rounder Hardik, plays for the Mumbai franchise in the Indian Premier League (IPL) which is also led by Rohit. Krunal, who made his international debut against the Windies at home last year, however, didn’t disappoint his skipper in the game. He picked 3 wickets for 28 runs as India came up with a much better bowling performance compared to the first game in Wellington on Wednesday. The Men in Blue were defeated by 80 runs on that occasion, tasting their worst defeat in the shortest format. New Zealand elected to bat after their captain Kane Williamson won the toss. The Black Caps put up a total of 158 for 8 in 20 overs with Colin de Grandhomme scoring 50 and Ross Taylor chipping in with 42. Last game’s hero Tim Seifert failed in this game, scoring just 12. 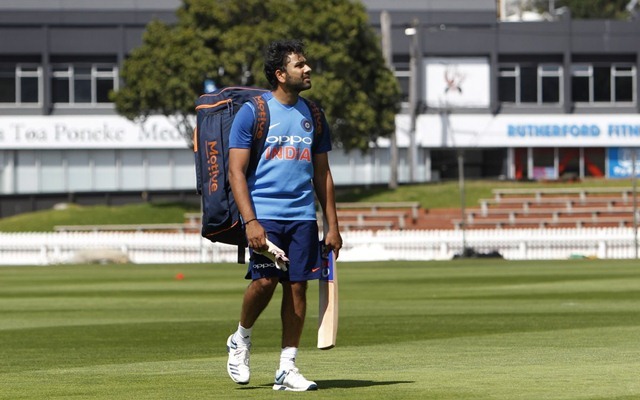 Rohit’s explanation behind playing the same XI in the second T20I didn’t convince the fans, however. They criticized the captain for sticking to Krunal despite the bowler going for 37 runs in his four overs in the last game and took just one wicket. Mumbai Indians massssss. Krunal Pandya show.. Rohit Sharma is a cool mind buddy, one bad performance he will not panic and change his team..
One would remember that this is the second instance in the 27-year-old bowler’s short international career that he came back strongly after facing the stick and a backlash from the fans. Last November, he came back strongly against Australia in the third match of the T20I series by picking his career-best bowling figures of 4 for 36 after failing to impress in the first game. On Friday, too, Krunal took some vital Kiwi wickets including that of Williamson (20) and Grandhomme to put breaks on the host team’s scoring rate.